Product Details - Material- Non abrasive material for the most persistent of the chewers,Use - Gently massages the gums and keeps tartar away, Non toxis and durable, Dimensions -11 cm. Product Information - These dog toys are ideal choice for teething puppies and pet dogs that like to chew around naughtily. Suitable for dogs and teething puppies. Made of hard rubber gum-massaging bumbs. Improves dental hygiene. 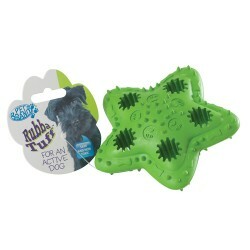 Rubba Tuff dog toys are very safe and can withstand continuous hours of chewing. Available in attractive assorted colours.